Today Turkish citizens are heading to the polls to vote in local elections taking place across the country, including an estimated 6 million young people, eligible to vote for the first time. 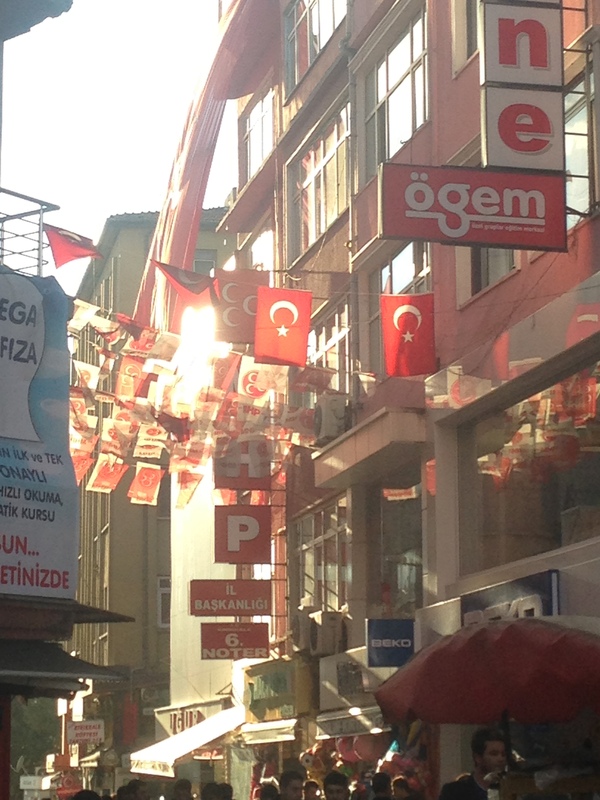 In the midst of election season, Turkish politics and civil society have faced waves of controversy. Issues involving internet access and freedom of information have taken center stage. These began with a series of protests which broke out in February over proposed internet regulations. Throughout the last few months, allegedly wiretapped conversations between Prime Minister Erdogan and his associates have been leaked onto YouTube by anonymous users; the authenticity of many of the records has been acknowledged by the PM. Use of Twitter was banned last week, and on Thursday YouTube was blocked by the Telecommunications Ministry following an audio recording of an alleged conversation between ranking members of the military regarding potential action in Syria. In addition, the last few months have seen the deaths, including that of fifteen year old Berkin Elvan, who was hit on the head with a gas canister by police forces during the Gezi Park protests, while going to buy bread. The incident put him in a coma, and he passed away in March weighing a mere 16 kilograms. His death sparked a fresh wave of street demonstrations and solidarity measures— thousands attended his funeral in Istanbul. 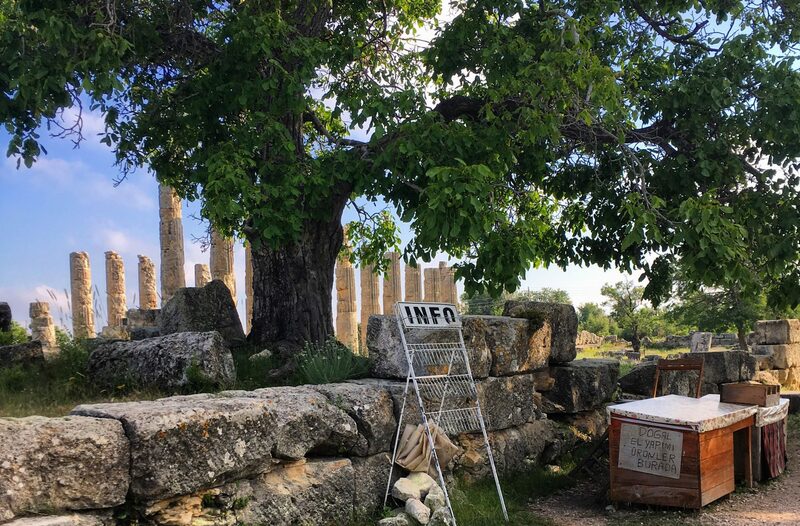 In the meantime, for the yabanci (foreigner) observer I am, the process of campaigning has been a fascinating thing to witness. 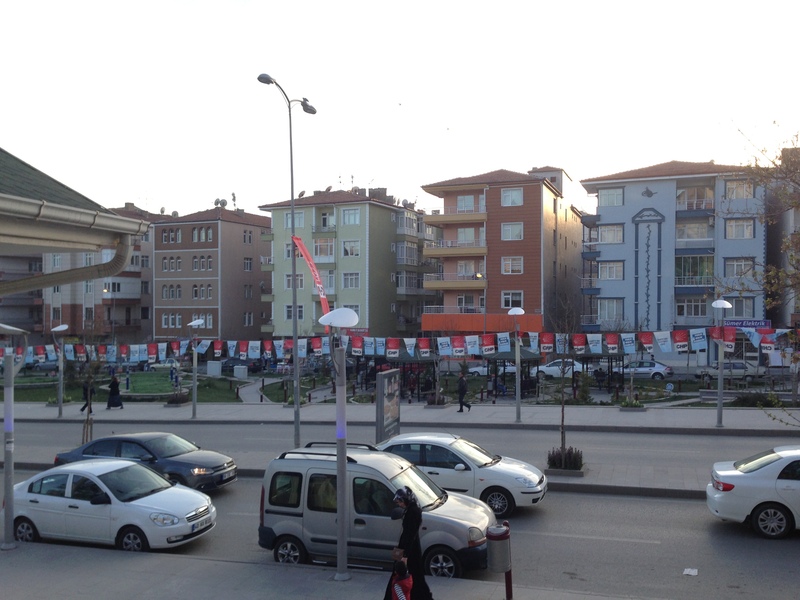 My city is rather conservative, with residents supporting the MHP, AKP, Saadet Partisi, and the CHP (in that order of popularity, an assumption based on the prevalence of campaign materials throughout the city). 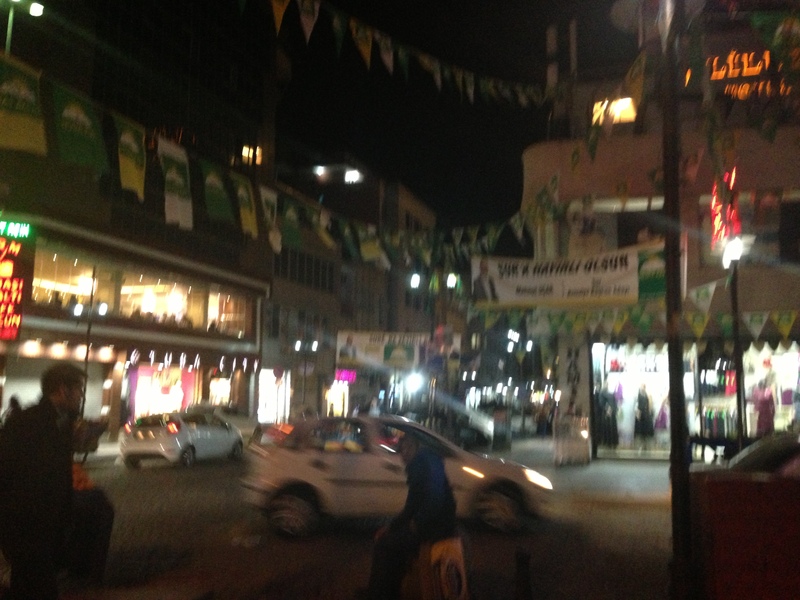 Right now the city is quite literally blanketed with images of candidates and party flags. In addition, almost every single candidate for Muhtar, (essentially a mayor for a district within a city, maybe the equivalent of a city council position stateside?) has knocked on my apartment door, asking for my roommates vote. The soundscape of the city has been drastically altered in the last two months as well. Every major candidate has at least one, (usually many, depending on their funding, sometimes even a full fleet) of cars and vans with images of the candidates and their parties logos screen-printed along the sides. These cars drive, or cruise rather, through the city constantly, blaring campaign songs which are often popular folk or wedding songs, with the candidates’ names and parties imposed into the lyrics. They are quite literally going for “name recognition;” the tunes are familiar and catchy. 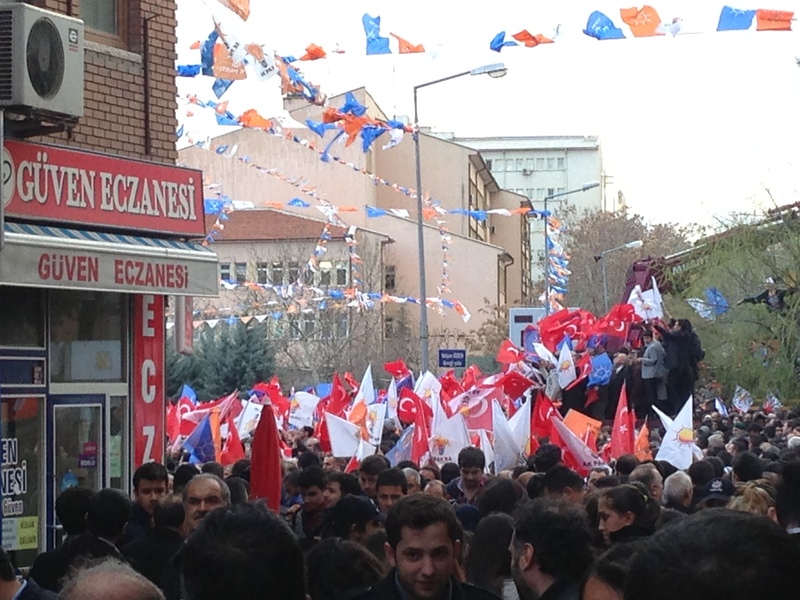 a lateral view of the gathering, from a side street that led into the city square where the speech was held. I didn’t enter the ‘meydan’ personally. 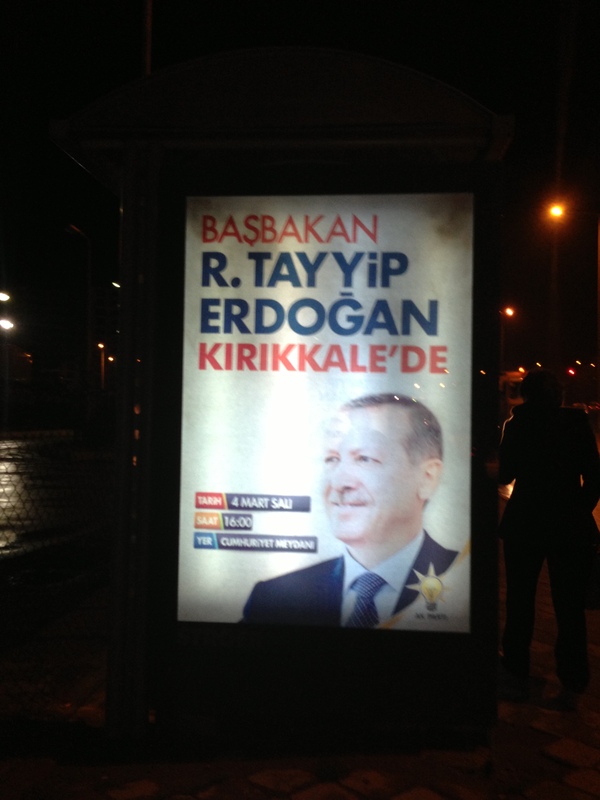 I also visited the southeast a few weeks before elections, which allowed me to view some interesting tactics used, especially by the incumbent AKP, in appropriating local cultures, and even languages in their campaign materials. 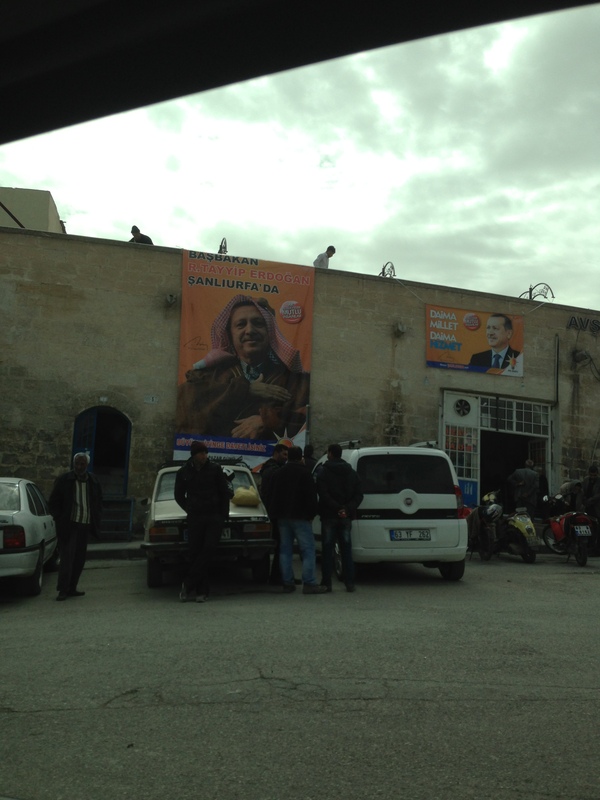 Alongside a building you see this advertisement for Erdogan’s upcoming visit to Urfa the following day, though it is quite different than the one seen in Kirikkale (Though those advertisements were standard in each city he visited, including in Urfa). In the image, Erdogan ‘wears’ clearly photo-shopped traditional dress from the region, mimicking the garb of agriculturalists in the region. What’s the purpose of this? Side note: This image being an important exception, I’ve been struck by what feels like an evolution in the images of Erdogan being used by the AKP. Increasingly, they seem to be modeled on the distinguished and ubiquitous images of Ataturk which define the country’s political visual imagining, especially in details like lighting, poses, and clothing. 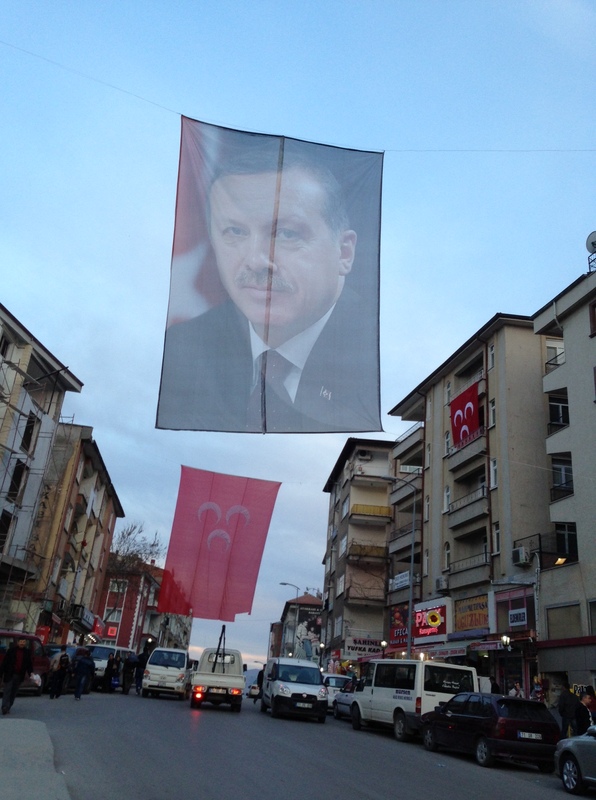 Many were disturbed and angered by the banners hung at the opening of the Marmaray in Istanbul on the country’s 90th birthday, when two color images of Erdogan and President Abdullah Gul hung alongside a black and white image of Ataturk. Some viewed this as both arrogant and disrespectful. I also consider this in light of a slogan prominently featured on AKP banners in my city, which say: “Ready for 2024!,” the implication being that the AKP (and possibly Erdogan himself) will continue to lead until Turkey’s centennial. Just observations…. 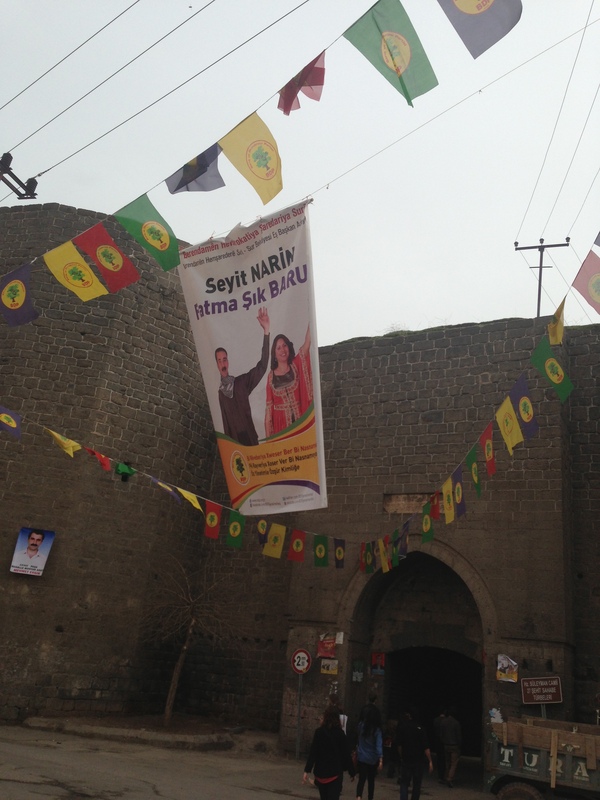 advertisements for the BDP (Peace and Democracy Party, the biggest Kurdish party) near one of Diyarbakir’s famous city walls. Candidates are shown wearing traditional dress. 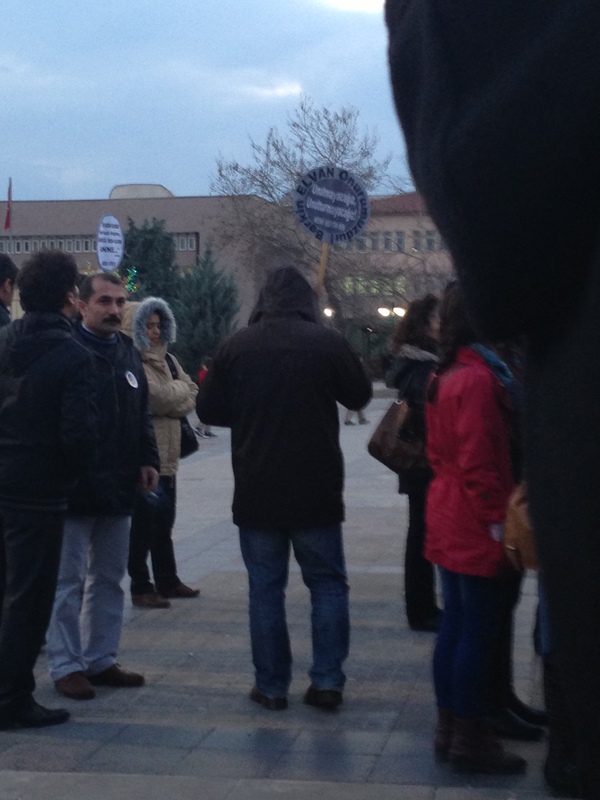 You can also see an AKP candidates poster in the distance on the wall. 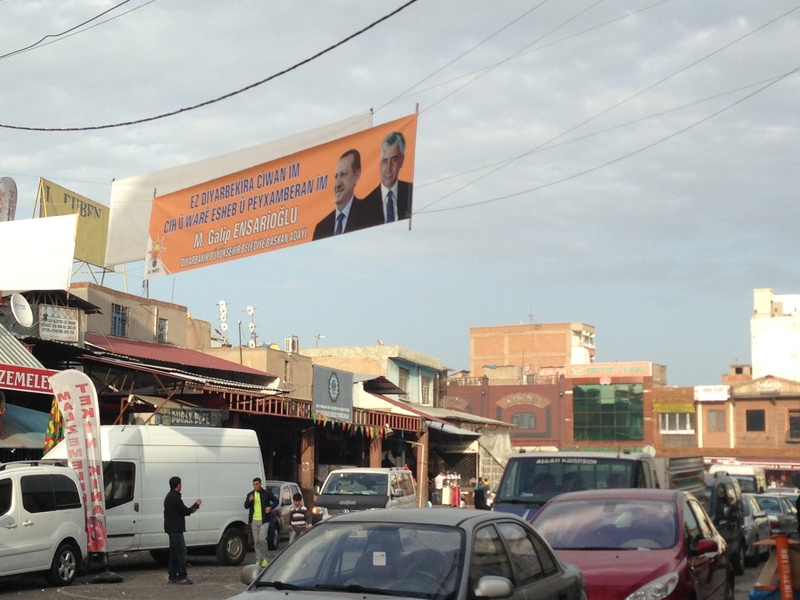 Others were not as surprised by this banner as I was… a display for an AKP candidate in Kurdish (on the other side it was in Turkish). 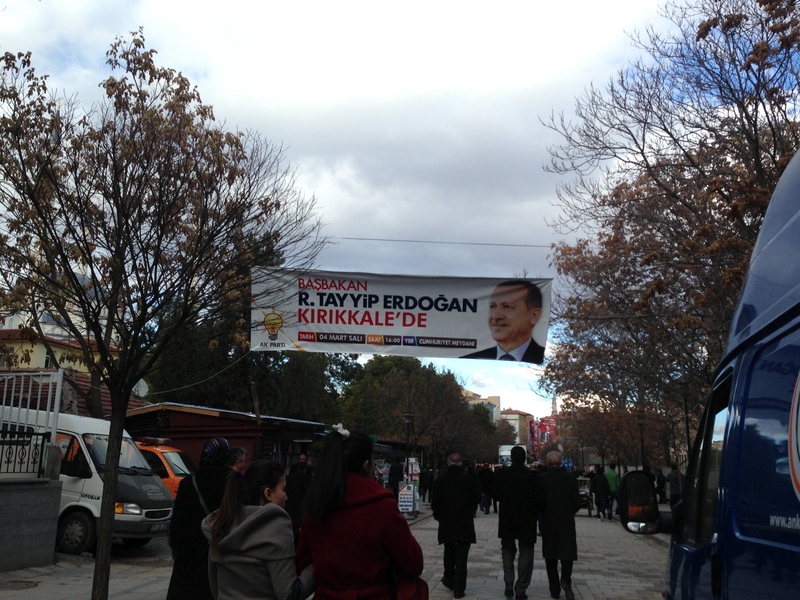 An image of Erdogan is ubiquitously shown next to AKP candidates in their campaign literature and media. 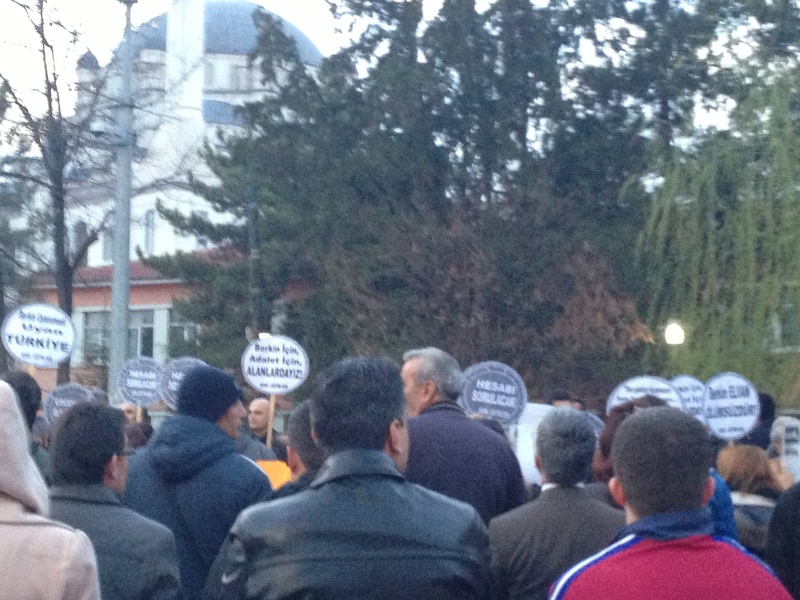 As mentioned above, there were massive protests across the country following the death of Berkin Elvan, but not in Kirikkale. A small gathering was organized in Kirikkale by a teachers’ union, and I went along with a friend to observe, and in solidarity with those mourning. 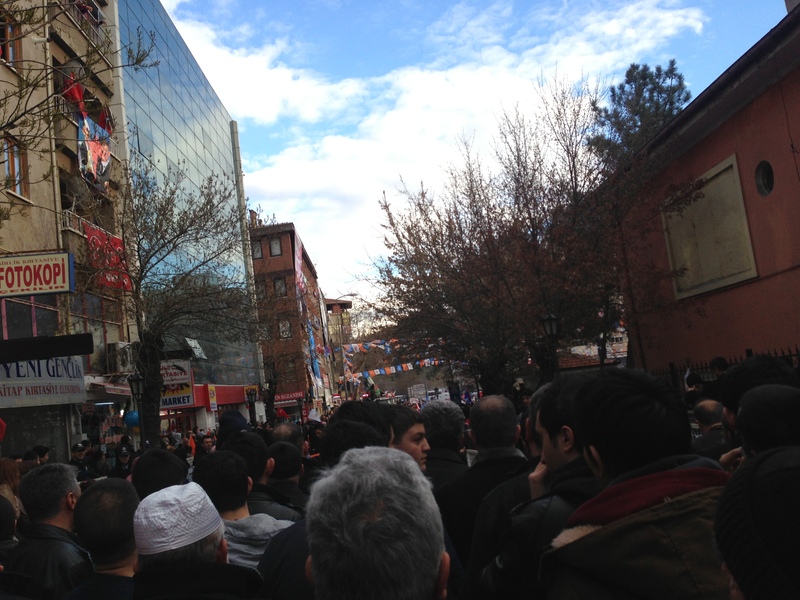 This gathering was in the same city square as where President Erdogan spoke, directly across from the police station, but unlike other gatherings across the country, there was virtually no police presence, and no disruption of the proceedings. 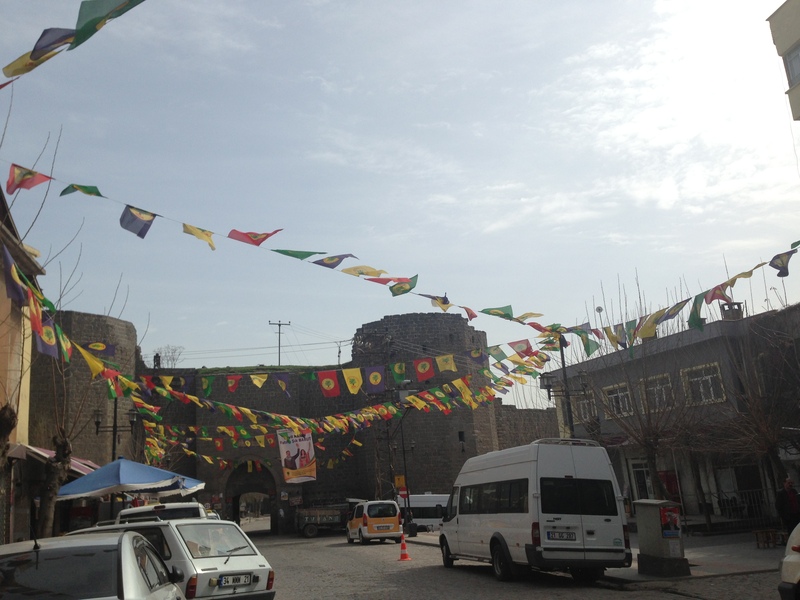 A week before the elections the head of the CHP came to Kirikkale, a choice I found interesting given the relative lack of support for the traditionally Kemalist party here. 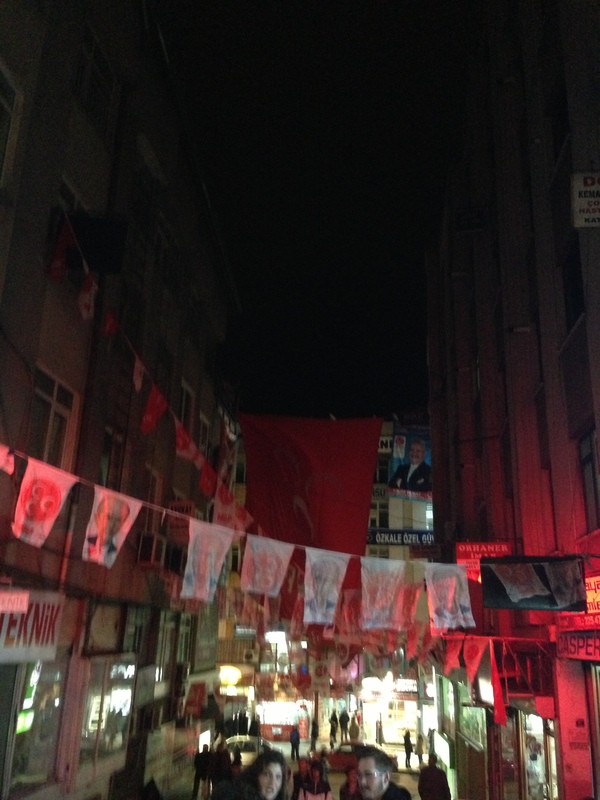 Here’s a shot of Bulvar Parki (incidentally which runs adjacent to Ataturk Bulvari [Boulevard]), maybe two blocks from my house, completely decked out in CHP flags. I’ll close this post with an image that captures the two images that have most characterized my experience of election season here. I took this photo just a couple days ago on one of the main streets in K-Town.